Place the WA Quantum chip anywhere on the device being treated. The Quantum chips do NOT conduct electricity. Do not interrupt any electrical connections with the chips. The Quantum Chips may be peeled off (cleanly) and reused multiple times, as long as you apply to a clean surface. Speaker Chips: For use on speaker cabinets. Place anywhere on the cabinet. Capacitor Chips: One per capacitor in standard and the mini version, which is for mini capacitors. Cable Chips: One chip per cable including power cords. Fuse Chips: Place one chip on each fuse anywhere it will not interfere with contact to the fuse holder. Fuse Chips come in two sizes: one for each of the common diameter fuse endcaps. 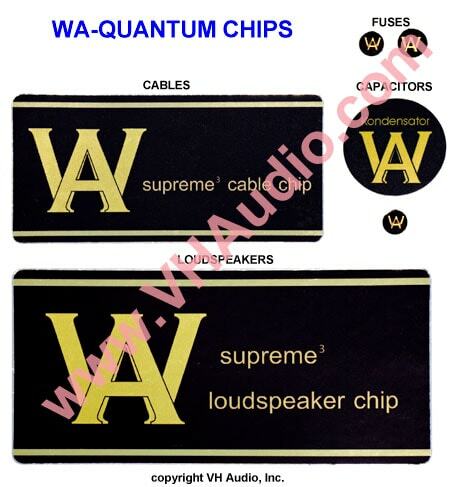 Order the WA-Quantum Chips online!